The only effective antidote for onion and garlic allergies is to completely avoid consuming either food, even in small quantities. An allergic reaction to a food is caused by a mistake of the immune system. 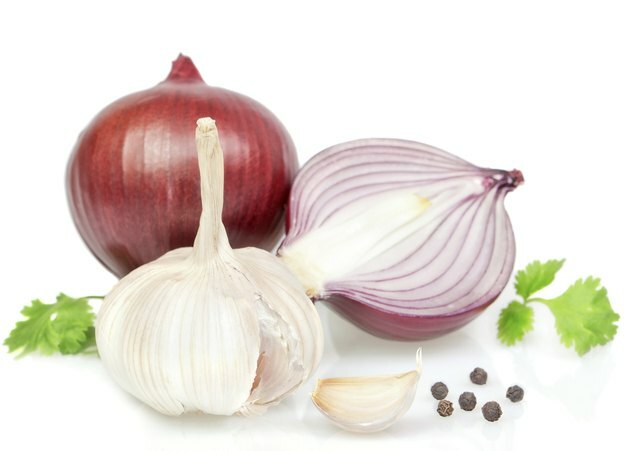 Your immune system reacts to the proteins found in onion and garlic as if they are dangerous for the body. This causes a chain-reaction of chemical production throughout your body that results in most symptoms. A strict elimination diet is the only way to avoid an allergic reaction to onion and garlic. Onion and garlic are not common foods that trigger an allergic reaction, but any food can cause an allergy. If you've been diagnosed with an onion and garlic allergy, you need to eliminate all foods that contain these foods. Common dishes that contain onion and garlic include omelets, pasta sauce, ethic foods, salsa, vegetable burgers and most condiments. Unlike other food allergens, onion and garlic are clearly listed in the ingredients, making it easy to identify and avoid. If you dine out, inform your server before ordering about your allergy to avoid an allergic reaction. Onion and garlic allergies are caused by a hypersensitivity to these substances. When the immune system identifies onion and garlic as dangerous substances, immunoglobulin E antibodies are released into your blood stream. These antibodies fight against the onion and garlic proteins, causing mast cells in soft tissues throughout your body to produce histamine. Increased amount of histamine causes inflammation in tissues, which leads to common allergy symptoms. Most food-related allergy symptoms cause inflammation in your lungs, sinuses, skin and digestive system. Symptoms typically develop within minutes of eating onion or garlic but can take up to an hour before surfacing. Common symptoms include chest tightness, shortness of breath, coughing, wheezing, sinus congestion, rashes, hives, facial swelling, abdominal pain, diarrhea, nausea and vomiting. If you develop severe symptoms, such as an increased heart rate, a metallic taste in your mouth, swelling in your lips, hives, lightheadedness and a sudden drop in blood pressure, call 911. These are signs of a severe allergic reaction that could lead to death. If you accidentally ingest onion or garlic, you can take an antihistamine to treat mild to moderate allergy symptoms. Skin reactions can be treated with hydrocortisone to reduce the itch and inflammation in the skin. If you develop a severe allergic reaction, you may need an injection of epinephrine to restore your body.